Cardiff boss Neil Warnock expects to see Arter back in green soon. Arter: could be back in time for Denmark and Wales double-header. HARRY ARTER HAS been urged to end his international exile and current dispute with the Republic of Ireland set-up by his club manager Neil Warnock. Arter sat out Ireland’s Nations League defeat to Wales and the friendly draw with Poland after a row with assistant manager Roy Keane. Keane hit out at Arter for missing training sessions and their heated argument was revealed this week via a leaked WhatsApp audio message from team-mate Stephen Ward. 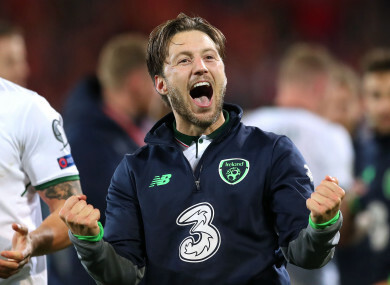 O’Neill has stressed there were other issues behind Arter sitting out the recent international break and the player has insisted he remains keen to return to the Ireland fold. Arter is spending this season at on loan at Cardiff City and their manager Warnock said, “Harry wants to play for Ireland and I’m sure it will all be ironed out. “I spoke to Harry about the situation and my advice to him was to get on with his football. He loves his country and he wants to play for them again. “We are talking about grown up people and I’m sure it is an issue that will be resolved. I’m not sure what happened and Harry can only tell me certain things. “From a selfish point of view I was quite happy he didn’t go away during the international break, but you get rows like this a lot of the time. “I had two players trying to kill each other the other day, so you get it everywhere. Little things spark things off in training. I don’t know what was said, or how it was said, but I’m sure there are lessons to be learned by everybody. I’m sure Martin will make sure this will be sorted in the next few weeks. Keane’s position has come under scrutiny after the offensive language he used towards Arter was revealed. The midfielder is one of the few players available to O’Neill who is playing regularly in the Premier League, but Warnock believes the criticism of Keane is not totally deserved. The veteran Bluebirds boss said: “Roy is Roy, isn’t he? When I got the sack at Sheffield United the only guy who spoke to me was Roy. I will never forget that. I thought that was a bit of class. Email “'He loves his country and wants to play for them': Warnock backs Harry Arter to end Ireland exile”. Feedback on “'He loves his country and wants to play for them': Warnock backs Harry Arter to end Ireland exile”.